David's 12" x 48" "Art on Canvas"
Click on each item below to open detail page with more information and to order. David has created a number of art on canvas pieces that celebrate the genius of his favorite musical groups and other subjects. These are long canvases (12" x 48") on which David makes use of an unbalanced style that draws the viewers eye from one side to the other. Initially, we are adding works on the Beetles and one from David's top hat series. He has many other works that we will be adding in the days ahead. The detail incorporated in each piece from the musical group series focuses on a particular album and you can find many familiar references that you will recognize. 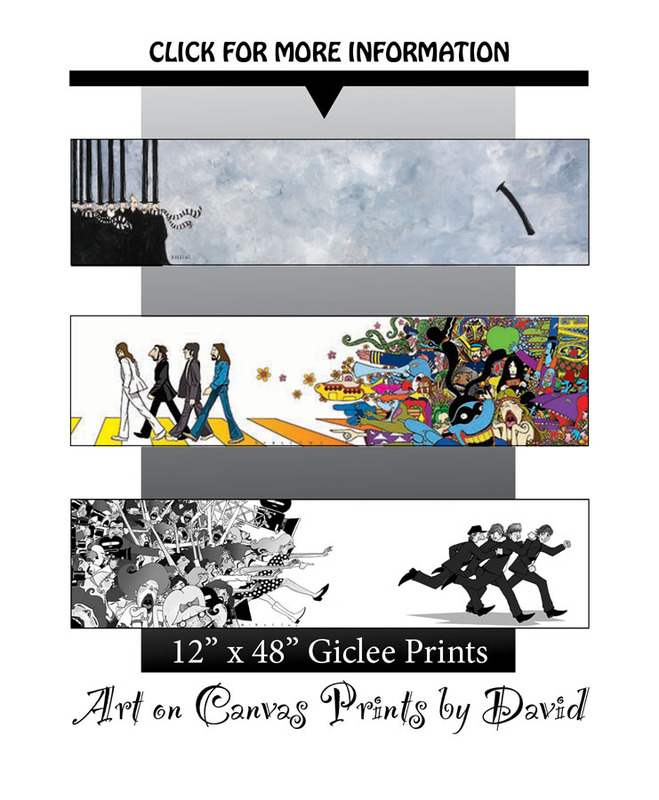 Since their introduction, these pieces of art have been some of David's best sellers. All are done in the whimsical style for which David is known and they have become collectors items as buyers hang them in groupings in their home or office. Each work is printed using the Giclee process to produce a museum-quality piece. A Giclee is "A fine art print created by a printmaker adhering to strict standards that utilizes special high resolution digital equipment throughout the workflow process leaving no evidence of the technology used, while providing archival quality consistent with that of a collectible fine art print." Only prints that adhere to strict printmaking standards can be called a Giclee. We enhance the Giclee printing process by using canvas to simulate the original. We also create art using a gallery wrap which extends the art along the depth of the frame used for a modern feel and the flexibility of hanging with or without an external frame. David has created a whimsical painting of our gentlemen with top hats on a blustery Fall day with the wind blowing, scarves flying and hats in jeopardy. You can almost see the errant hat moving across the tableau as the loser looks after it forlornly. While his expression is stoic, you can almost hear him whisper under his breath: "Gone With the Wind". Click for more information and to order. Here's one of David's musical group series in which the Beatles are racing away from adoring fans and the movie cameras. "Hard Days Night" was their first movie, shot in black and white, in which they pretty much play themselves. This piece of art when hung in your home or office will make you "feel all right"! Click for more information and to order. This is one of David's musical group series in which the Beatles are walking down the familiar Abbey Road. Behind them, there's a bevy of familiar images from their past. What Beatles fan can resist having this piece of art with so many reminders of moments in the fabled history of the "Fab Four". Click for more information and to order.